AOpen Inc., one of the leading PC platforms and solutions suppliers in the world, debuts its first XC Cube supporting 64-bit platform today -- EZ945. 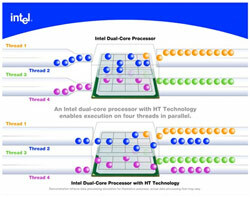 The new product is designed to support Intel’s newest dual core CPU with a Front Side Bus (FSB) which can run up to 1066 MHz. The new product is built with Intel 945G Express and ICH7 chipsets, the newest family of Intel’s chipsets and Input/Output Controller Hub for next-generation PCs. Because the product is built with 945G Express chipset, it can be installed with the fastest Dual Channel DDRII memory modules running at 667/533 MHz. Memory on the motherboard can be expanded to 4 GB. The 945G Express chipset delivers outstanding system performance through high-bandwidth interfaces such as dual-channel DDR2, 1066/800 MHz system bus, PCI Express x16 graphics port, PCI Express x1 I/O ports, Serial ATA2 which runs at 3.0 Gbps and Hi-Speed USB 2.0 connectivity. The other features of the product include the next-generation on-chip graphics processor GMA950 with native DirectX9 support, support to HDTV for Home Multimedia, Intel High Definition Audio (known as Azalia) and even Dolby Digital Surround. In addition, the new product supports Intel Active Management Technology, the next-generation of remote client network management. Since the motherboard of the new product is built with 945G Express chipset, it supports a wide range of Intel CPUs, including Pentium D processor, Pentium 4 processor with Hyper-Threading Technology and all other Pentium processors and Celeron processors in the LGA775 socket, with scalability for future processor innovations. The motherboard of the new product is the first batch of this year's PCs that support dual core CPUs, which are the fastest Intel CPUs currently on the market. Because an on-chip graphics processor GMA950 is built on board, the user does not need to install an add-on graphics display card to this motherboard. Because the 945G Express chipset is designed to follow PCI Express architecture, those users who desire to take advantage of more powerful 3D graphics processing capability or gaming enthusiasts can install more powerful graphics card to the system. The new product is built with ICH7 (Input/Output Controller Hub 7), which provides the most powerful and fastest I/O control features currently available in Intel’s family of I/O controllers. ICH7 is designed with embedded SerialATA-II and IDE hard drive interface, Intel's High Definition Audio Interface that support 7.1-channel surround sound, integrated LAN Controller, and enhanced video processing capability. A unique I/O shield comes handy at the product's rear panel. It arranges the rear panel connectors in such a thoughtful and convenient way that 7.1 audio connectors, two PS/2 ports, two COM ports, four USB 2.0 ports, one 1394 port, one Realtek Gigabit LAN port, and one printer port are grouped together as shown in one of the photos published together with this press release. The system is built with AOpen's innovative CPU cooling system. 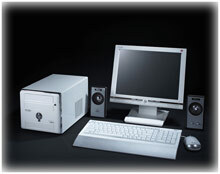 Another next-generation feature incorporated into the new Cube PC is AOpen's unique thermal technology. In order to develop next-generation thermal dissipation technology, AOpen installed a wind tunnel at its laboratory for the development of the new CPU coolers. After many lab tests, the most high efficiency CPU cooler was selected to go with the new product. Nearly all system cooling components, CPU coolers, and cooling fan mechanisms have been tested in AOpen's Thermocline thermal laboratory which was certified by a Japanese thermal lab to meet UL, TUV, and other industrial standards. The CPU cooler of the new product is built with award-winning airflow re-direction mechanism or fan guide that re-route the direction of airflow so that the heat is ventilated in a more efficient way. The CPU cooler is designed in a way similar to the airflow design of turbo engines. Better heat ventilation effect is also achieved through innovative housing design. Hot airflow can be exhausted through the ventilation slits designed on the sides of the XC Cube. 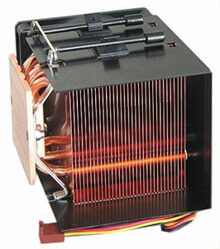 The CPU cooler is designed with a special "copper skive fins" which is not available in conventional CPU coolers. AOpen proprietary copper alloy Heat-pipes filled with liquid coolant are designed to run through the copper fins to take away the heat more efficiently. Another unique feature of the CPU cooler is the copper fins are cut from a solid square copper stock and formed into layers of fins rather than welded onto a copper base. Such a process leads to outstanding thermal performance because the molecular arrangement of the fins is much better than conventional heating-dissipating fins welded together. Moreover, the molecular density of the copper fins is denser than the aluminum fins used for making conventional CPU coolers. 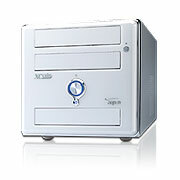 In order to fit with various CPUs, it is designed for easy installation and disassembly. The edges of the cooler are polished so that it prevents users from being cut inadvertently. The high performance CPU cooler in the new product can meet the most stringent environment-friendly, functional, recycling, noise-free, and pollution-free specifications of industrialized countries such as Japan, Germany, and the U.S. The dimensions of the new Cube PC come in AOpen proprietary form factor – 190 (H) x 320 (L) x 200 (W) mm.